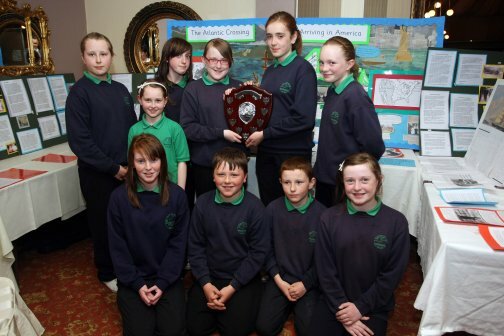 Murroe N.S., Dunfanaghy, runners up in the primary schools competition. Kieron Byrne and Derek O'Driscaoll, Carrick V.S., joint winners of the Cecil King Cup. 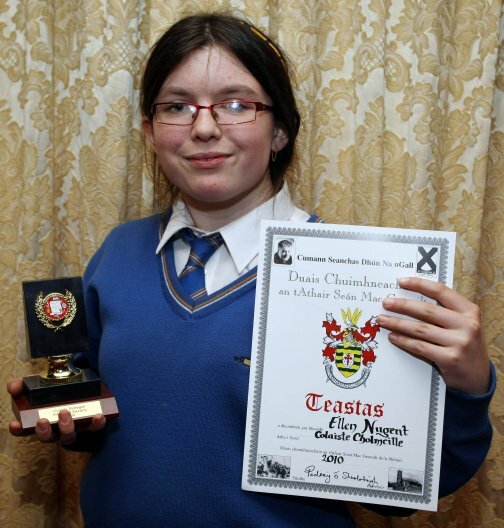 Ellen Nugent, Coláiste Cholmcille, Ballyshannon, winner of the individual award for second level students. 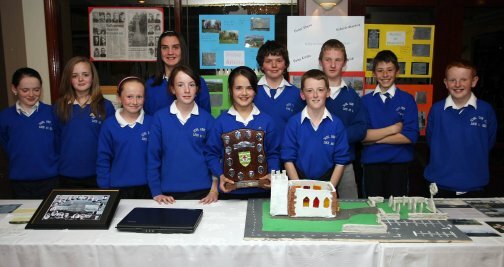 5th Class, Scoil Íosagain, Buncrana, one of the runners up in the primary schools section. 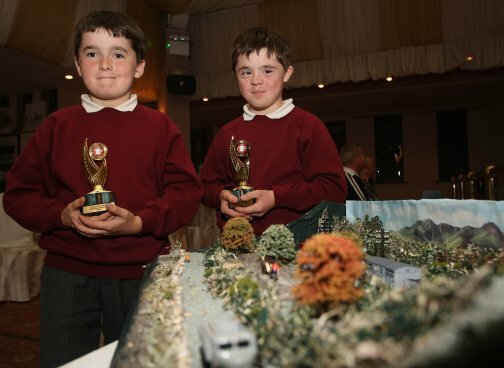 James and Jude Nugent, Creevy N.S., Ballyshannon, winners of the "Small Group" competition. 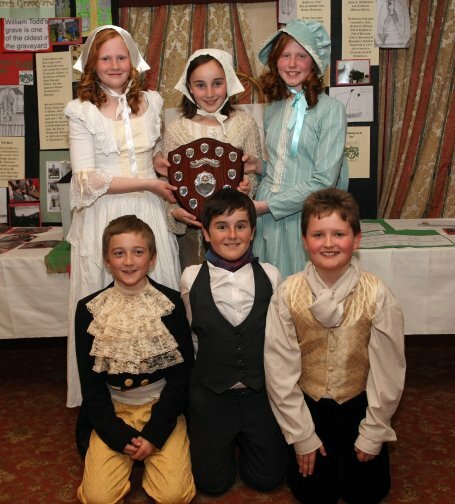 The young historians of the county put on a great show on Wed.12th May in Jackson’s hotel. 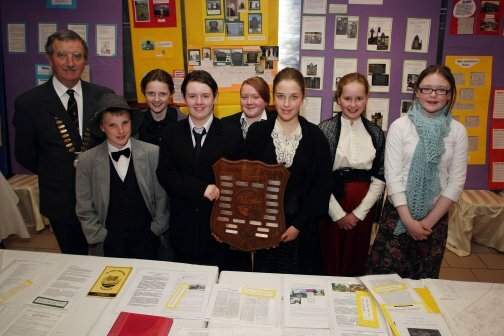 They were taking part in the 36th annual schools history competition, organised by the County Donegal Historical Society. This years’ topics were Graveyards, Emigration, Sport, Railways, Bridges, and Historic Buildings. Donegal is of course steeped in history and some very interesting projects were produced, with ‘graveyards’ and ‘emigration’ the most popular choices. Students had to produce a folder of information and then set up a stand on ‘presentation night’. Each group had a 15 minute slot, to chat with the judges or make a presentation. 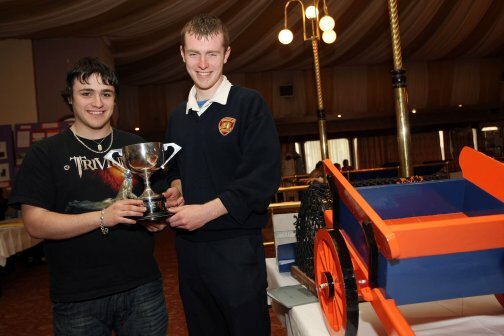 Schools from across the county; Buncrana - Ballybofey – Ballyshannon, were represented. A lot of effort was put in by the students themselves and their teachers, who worked long hours to help them produce the finished product. The judges had an onerous task in deciding the destination of the main trophies, and I would like to thank Helen Meehan, Aine Ni Dhuibhne, Leonard Roarty and Charles Boyle for their dedication and effort. In the end everyone was a winner. It was a great night of colour and chat and everyone learned something new. The judges were greatly impressed by the knowledge and enthusiasm of these young historians and they were certainly a credit to their parents, schools and communities. Ellen Nugent, Colaiste Cholmcille, Ballyshannon. James and Jude Nugent, Creevy N.S., Ballyshannon. Anna Doherty, Stacey Mc Gee, Matthew Clarke & Louise Brogan, Scoil an Linbh Iosa, Carrigans. Derek O’ Driscoll and Kieron Byrne, Carrick V.S.